Moon lights the wild Pacific Coast of Washington State. My campsite sits just outside the frame to the left in the dense trees & fog. If someone said you can only go to one place to take photos for the rest of your life my answer would be Olympic National Park. I've spent 2 months of 2015 at Olympic & hope to spend just as much or more in the park next year. The vast network of backcountry trail systems through different ecosystems is unmatched by any other park that I've found. 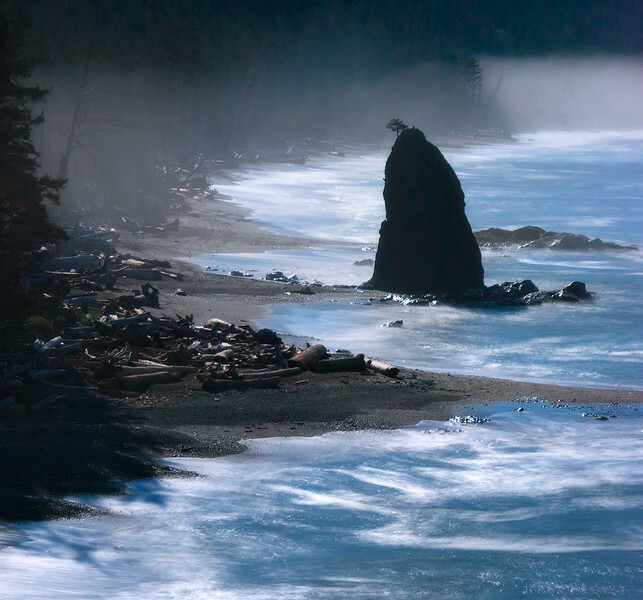 This specific image comes from the coast just North of Rialto Beach which provides access to the Wild Coast Section of backcountry trails. From this location you can hike all the way up to the Ozette Triangle and even further. These are some of the best / most picturesque coastlines on the planet. Everything in Olympic National Park makes you feel small and weak. Nothing in the park is by any means young. Some of the Spruce Trees in the park are pushing 1000 years old. The massive sea stacks and currents will crush you and end your life without warning. Olympic is one of the few places in the lower 48 which still feels truly wild. If you get a chance to travel anywhere in life, go to the Olympics and spend at least 2-3 weeks. Go off the beaten path, into the Queets, deep into the Hoh, the Bogachiel, the Quinault & Dosewallips. Better yet, go alone, don't talk to or see another human for 5 days and see what it's like. These experiences are becoming lost in our world, but they matter more than most things we currently focus on. These are special places that have taught me more than any text book, blog post or social media status ever will. This specific image comes from a single RAW file captured at ISO1200, f/4 & 12 second exposure time. I wanted to keep the exposure low enough to capture some of the water movement in the foreground. The full moon lit the landscape enough to pull out most of the details in the beach and trees. My campsite is waiting just out of the frame to the left.